New Hire Safety Kit by ERB Safety. Contains a Liberty White helmet, Boas Clear eye protection, ERB Corded reusable ear plugs and a pair of work gloves. Price/Kit. #19956 HARD HAT, BLUE, OMEGA II, 6-POINT SUSPENSION WITH MEGA RATCHET ADJUSTMENT. 12 HATS/CASE. PRICE/HAT. OMEGA II STANDARD WHITE HARD HAT, 6-POINT SUSPENSION. NO RATCHET. A HIGH QUALITY YET ECONOMICAL 6-POINT HARD HAT. #19951 HARD HAT, WHITE OMEGA II 6-POINT SUSPENSION WITH MEGA RATCHET ADJUSTMENT. 12 HATS/CASE. PRICE/HAT. OMEGA II STANDARD YELLOW HARD HAT, 6-POINT SUSPENSION. NO RATCHET. 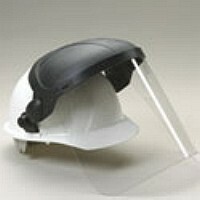 A HIGH QUALITY YET ECONOMICAL 6 POINT HARD HAT.